In 2017, more than 400,000 acres burned across the state of Arizona. Up more than 100k acres from the previous year. From January 1st to December 31st, 2017, the Department of Forestry and Fire Management and our cooperators responded to 2,202 fires in Arizona. Of those 2,000+ fires, 74% of them were human caused. Know before you go. 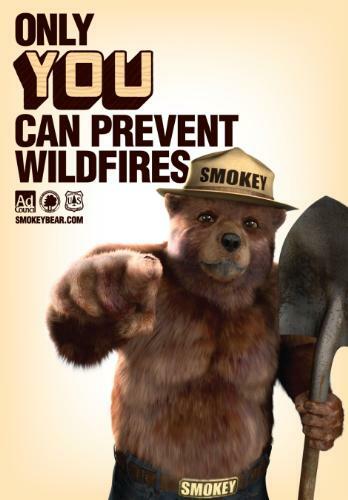 Check fire restrictions and ALWAYS put out a campfire completely walking away. Drown with water, stir, and repeat. Make sure it's cool to the touch by checking with your bare hands before leaving your campsite. Never turn your back on a fire. Before using a lawnmower, check to make sure your yard is free of large rocks. All it takes is one blade to hit a rock and spark a fire. Always refrain from using any kind of chainsaw or welding equipment during high fire danger. Please refer to the fire restrictions page for more information. Both target shooting and fireworks are never allowed on state lands. Many Arizona cities and towns have restrictions on fireworks usage. Check with your county before purchasing or using fireworks. There are steps you can take to protect your property from being destroyed in a wildfire. The most important - create defensible space. *Trim back any dead/dying tree limbs or shrubs that come within a few feet of your property. *Remove all fuel sources from within 30 feet of your property. This includes, propane tanks, lumber, wood piles, or anything else that could ignite quickly. *Keep gutters and porches free of pine needles, leaves, and other debris. *Keep your lawn mowed and watered.